The O.M.S. Low Level Bulk Palletizer Model Series 500, 600, 700, 800 and 900 are offered semi-automatic to fully automatic. Eye level operation provides easy access and monitoring by personnel performing other in-plant duties. 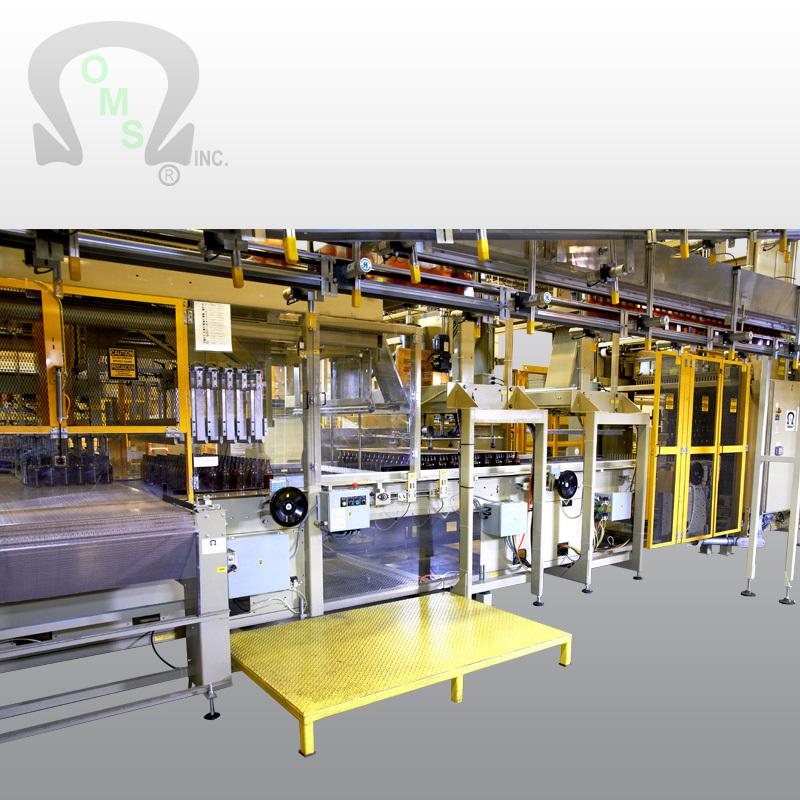 In various plant layout applications, the monitoring person attends to more than one O.M.S. “Smart” System. 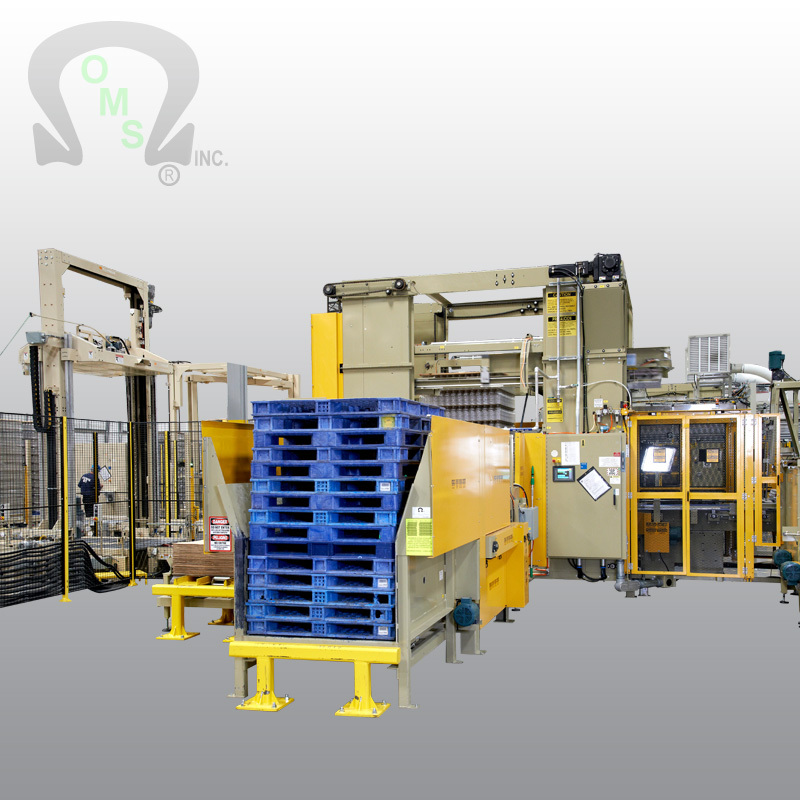 In addition, the monitoring person can replenish the tier sheet, picture frame and pallet dispensers at periodic intervals and also attend to the strapping and wrapping machines. In many plants, that same person also prints out bottle type/size identification labels affixing such to the finished product pallet loads and still has time available for other tasks. The operating labor cost savings are limited only to the extent of one’s applied imagination. Available with 3, 4, 6 or 8 lane entry. 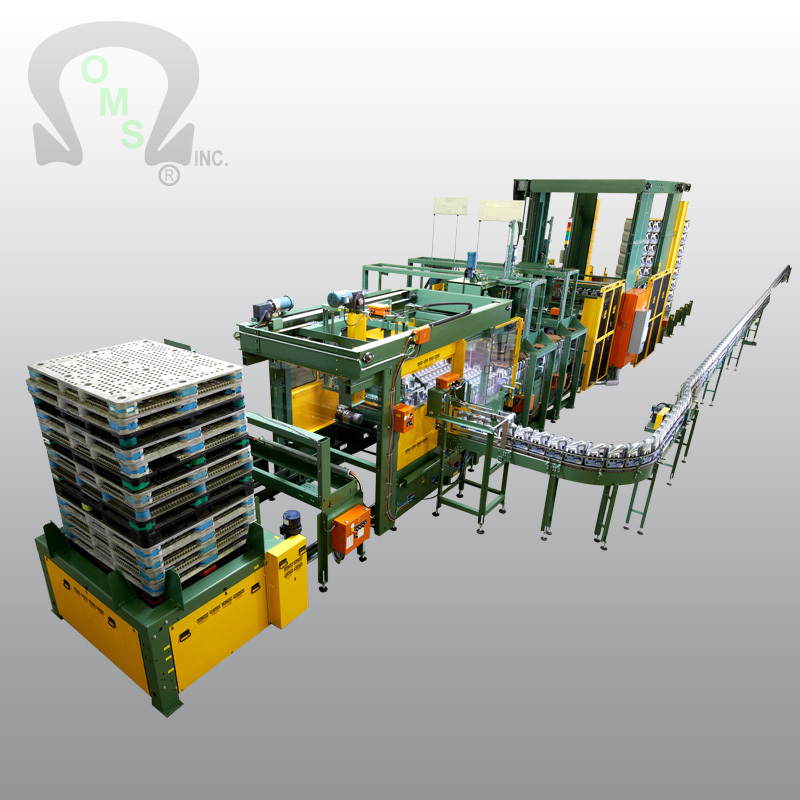 Want more info about this Bulk Palletizer? Available with 1, 2, 3 or 4 lane entry. The O.M.S. System offers a superior approach, forming layers and pallet loads. Rows of containers (bottles, jars, cans, etc.) Are asynchronously processed. 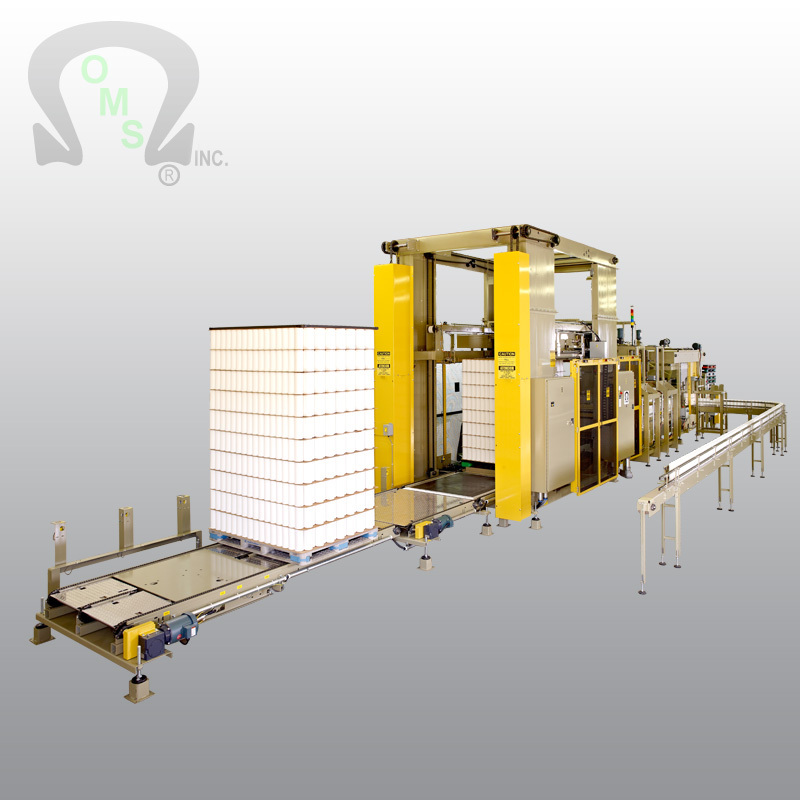 Multi-row infeed systems are equipped with separation lane dividers to ensure positive container control. Containers are individually counted to form an exact quantity per row. The rows are also counted to form an exact number for a given pattern array(s). The O.M.S. 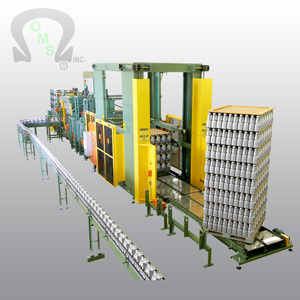 System provides automatic staggered (nested) pattern forming. Layers are individually processed and maintained from grouping throughout the palletizing cycle. 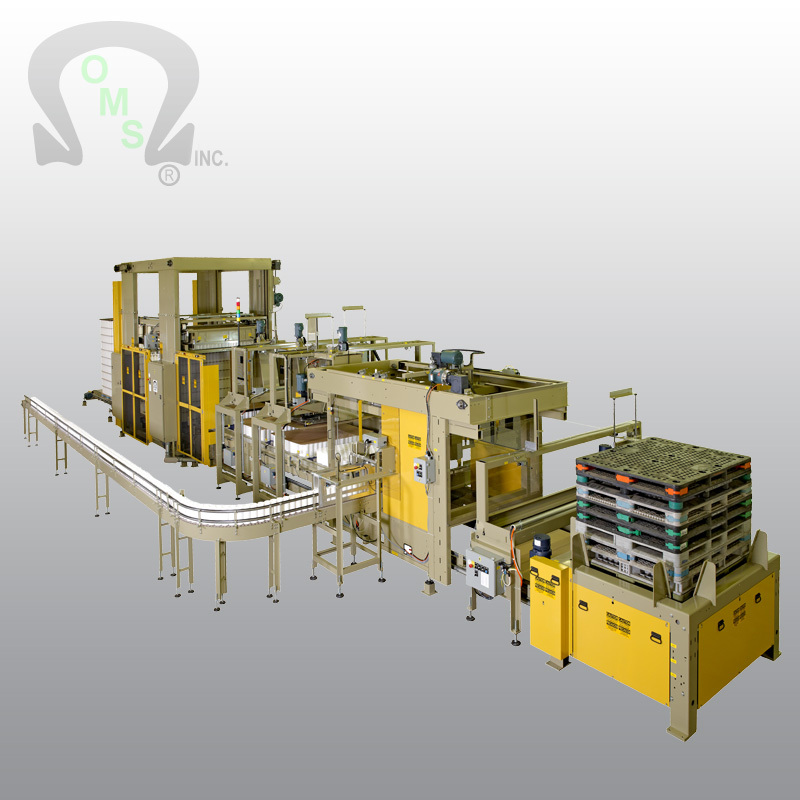 Automatic layer retainer guides provide for reliable pallet load stability. Each layer of containers is gently yet firmly retained on all four sides and bottom during layer handling and stacking. 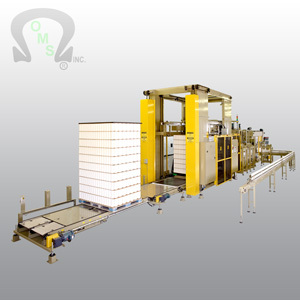 In essence, the layer is encapsulated during the entire transporting and delivery cycle. The layer sheets are conjointly transported with each associated layer, to include combination top layer sheet and picture frame. 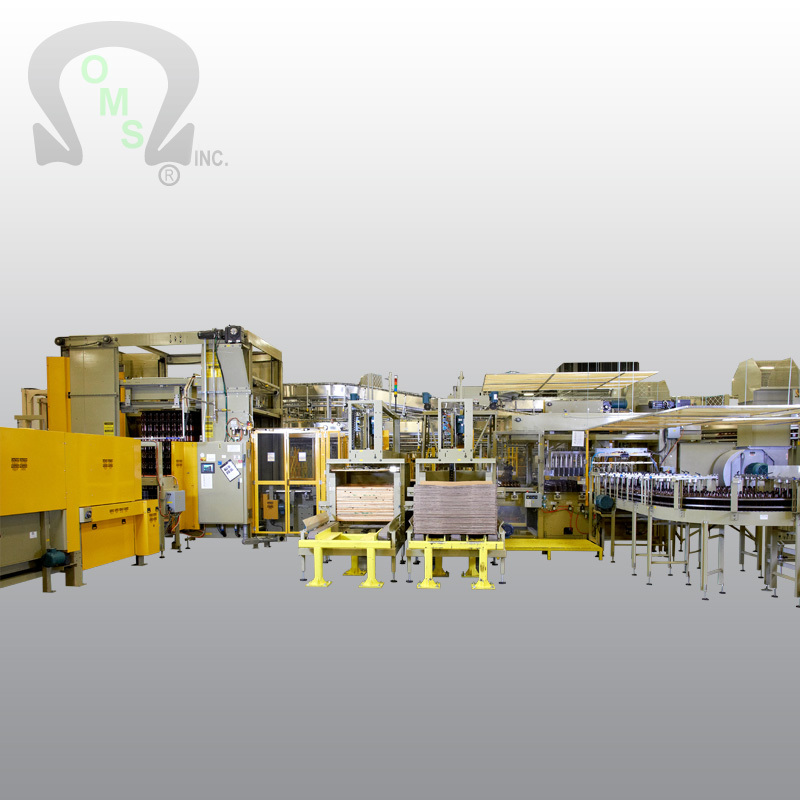 The automatic retaining guides further maintain layer sheet and picture frame to container layer unity. The layer plate systematically extends forward, overlapping the previous layer (closing the gap) for smooth transfer flow. A retainer mechanism achieves positive control of the preceding layer sheet.